As I write this article, I realized it is December 21 and the Winter Solstice has crept into our lives. On December 21, the Sun reaches its southernmost position as seen from the Earth, and that determines the Winter Solstice as we see it from the Northern Hemisphere. The Winter Solstice comes every year in the Northern Hemisphere on this date, and is regarded as the first day of winter. This day offers the shortest period of daylight and the longest period of night. The level of winter depends on where one lives in the Northern Hemisphere. The word Solstice comes from the Latin words sol, meaning Sun and sistere, meaning to come to a stop or stand still. At that moment, the Sun’s motion does not go north or south as during most other days of the year, but it stands still. That time then, is the first day of winter in the Northern Hemisphere and the first day of summer in the Southern Hemisphere. And for those of us in the Northern Hemisphere, that means we must begin to think about the needs of our pets when the weather turns colder, and in some locations snow begins to cover the ground. The days are shorter with less sunshine and chilling winds may come across the country. As pet owners, we have the responsibility to protect them from the cold, snowy days of winter by providing them with proper shelter, food, and exercise. Know your pets’ cold tolerance limits. If needed, talk to your veterinarian about your pet’s specific needs. Much like people, pets’ cold tolerance can vary from pet to pet based on the thickness of their coat, body fat, activity level and health. Adjust your winter activities to the level of your pet’s comfort. It may be necessary to take more frequent, shorter walks in very cold weather to protect both you and the dog from weather-associated health risks. Arthritic and elderly pets may have more difficulty walking on snow and ice and may be more prone to slipping and falling. Short-haired pets feel the cold faster because they have less protection and short-legged pets may become cold faster because their bellies are more likely to encounter snow-covered or frozen ground. Pets with diabetes, heart disease, kidney disease, or hormonal imbalances may have a harder time regulating their body temperature, and may be more susceptible to problems from temperature extremes. The same goes for very young and very old pets, or those with compromised immune systems. For those inside dwellers that go outside to the bathroom, be sure they find a spot to go that allows them comfort in performing their duties. Packed snow and ice may make it difficult for them go to the bathroom especially if they have arthritic hip joints or feet. If their favorite spot is covered with snow or ice, take them out on a leash and encourage them to pick another spot. 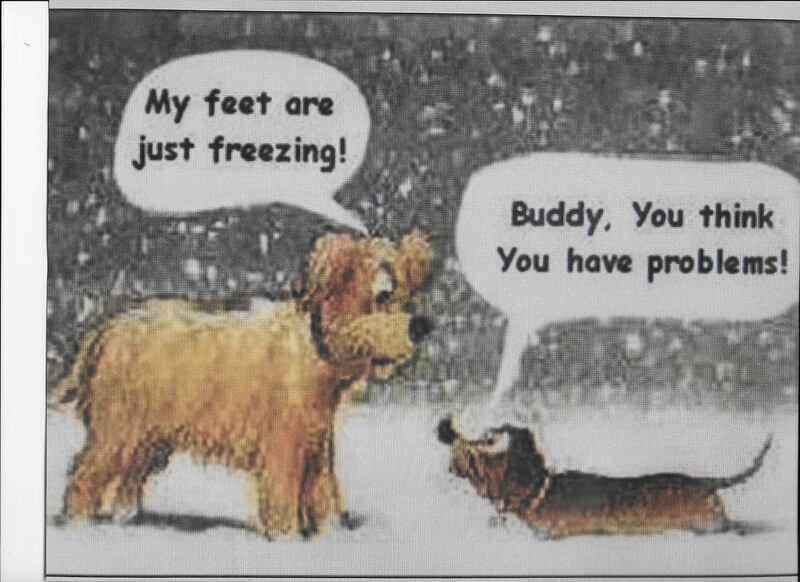 Check your dog’s paws frequently for signs of cold-weather injury or damage, such as cracked pads or bleeding. During a walk, sudden lameness may be due to an injury from slipping on slick surfaces, puncture by a sharp object that is hidden under the snow and ice, or may be due to ice accumulation between the toes. You may be able to reduce the chance of ice ball accumulation by clipping the hair between your dog’s toes during the winter season. It is best to take them out on a leash during the winter months, so you can choose the most acceptable spot for them to attend to their bathroom needs that exposes them to fewer dangers than they may encounter on their own. Being on lease also protects them from encounters where they venture out on frozen lakes or ponds with the chance of breaking through the ice. Some dogs go off-leash during these cold, damp winter days so consider placing a brightly colored, water-resistant coat that can easily be seen in the snow on them. Be sure the coat or sweater is dry as wet pet clothing can make your pet colder. You may want to keep several coats or sweaters in the closet to make sure the one you choose is dry at that time. Some dogs may need ear protection. You can purchase a dog ear muff at most pet shops or you can create one by cutting the top off an acrylic knit human hat and place it over his ears. It may be beneficial to try foot booties to keep his feet dry and from gathering snow and ice between his toes. 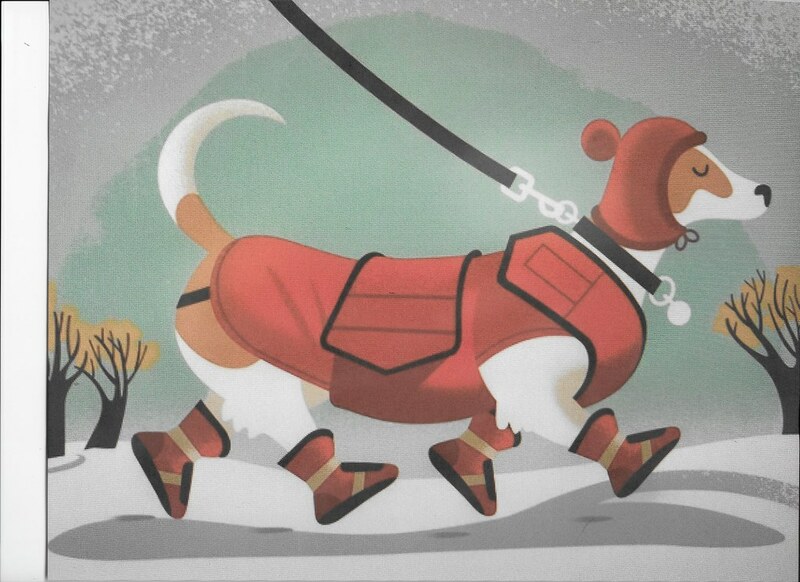 Be sure to practice placing the booties on your dog prior to venturing outside. Some dogs simply will not tolerate booties on their feet. During and after walks, wipe down your dog’s feet, legs, and belly as they may have picked up salt deicers, antifreeze or other chemicals used to melt the snow and ice that may be harmful to your pet. Clean up any antifreeze spills quickly, as even small amounts of antifreeze can be deadly. Also, antifreeze appears to have a sweet taste and dogs will drink more of it than they will water and that may cause kidney damage that leads to severe symptoms, including death. If your dog does stay outside all the time, consider creating a place in the garage or the utility room on those extremely cold nights. Fix a cushioned spot for them to be protected from the cold, wind, rain, and ice that winter storms can bring. If there is no place for them inside, be sure their dog house is weather proofed by covering all the cracks in the sides and roof with material that will withstand the wind and prevent the cold and snow from penetrating into the house. The dog house should have a floor and be elevated off the ground, so the dog’s paws do not touch the cold ground. Provide bedding such as old carpets, blankets, bath towels or straw on which they can sleep and to snuggle under for warmth. Change the bedding frequently to ensure it remains dry. Make sure fresh water is provided several times per day and feed a high caloric dog food to help them ward off the cold. Inside your home, use special care with space heaters. Pets can burn themselves when trying to get close to the heat, or they can knock a space heater over and put the whole family at risk. Cold weather also brings the risks of severe winter weather such as blizzards and power outages. Prepare an emergency or disaster kit for both you and the family pets. Some pet owners feel that a little extra weight gives their pet some extra protection from the cold, but the health risks associated with extra weight does not make it worth doing. Watch your pet’s body condition and keep them in a healthy weight range for their breed, age, and health conditions. Outdoor pets will require more calories in the winter to generate enough body heat and energy to keep them warm. Talk to your veterinarian about your pet’s nutritional needs during cold weather. If you have pet birds, keep their cage out of drafts such as doorways and lesser heated areas of the house. 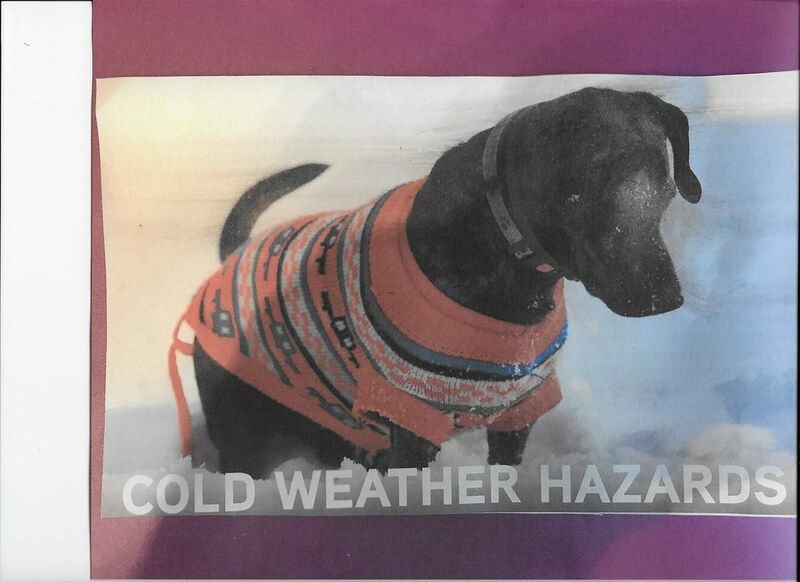 Pets can become lost while outside in rough, winter conditions due to the snow and ice cover that may change the appearance of their known environment or recognizable scents that might normally aid them in finding their way back home. Make sure your pet has a well-fitting collar with all its contact information including address and telephone number imbedded on the collar. My choice of a permanent pet identification marker is the microchip. Microchips currently used in pets are not a GPS device and cannot track your animal if it gets lost or stolen. However, companies that manufacture microchips maintain a data base of all their microchips that include name of owner, address, and telephone number for finding the original owner of the pet. I believe all pets should be microchipped. Consult with your veterinarian for making sure your dog or cat gets properly identified should it become lost by injecting a permanent microchip under its skin. Hot cars are known to present a threat to pets in the summertime; however, cold cars pose a significant risk to your pet’s health as well. Cars can cool down rapidly in winter conditions resembling the interior of a refrigerator while cooling down your pet. Pets that are young, old, ill, or thin are particularly susceptible to cold environments and should never be left in cold cars. It is best to leave the pets at home if there is a possibility they will need to be left in the car for any period while you are out shopping or running errands. Cats seem to tolerate the cold temperatures better than dogs; however, we should take special care around cars. Cats will curl up against anything to stay warm including a car engine. Many times, we will get into cars that are left outside only to start the engine and a cat will dart from under the hood having been curled up against the engine or radiator to keep warm. This results too many times in injury to the cat with cuts from the fan or belts or burns. Usually a tap on the hood of the car or a honk of the horn will be enough for the cat to escape its warm spot before the car is put into operation. Preparing for the comfort and well-being of your pets during the trying times of extreme winter weather can be a difficult task if some thought and preparation does not go into the planning stages during ideal weather. Cold weather requires special considerations for the pets, and if the other family members plan for the cold and icy weather, the whole family benefits. It is by far better to be prepared for cold weather and let the pets be a part of the family activities as is normally the case. That makes for a complete and happy family!